What do you get when you host the largest 3D printing tradeshow in the Motor City? A 3D Printed Slot Car Championship where everyone wins! Whether you’re a slot car enthusiast or just love to see the amazing designs that are only possible thanks to 3D printing; the RAPID 2014 Conference and Exposition was the place to be. 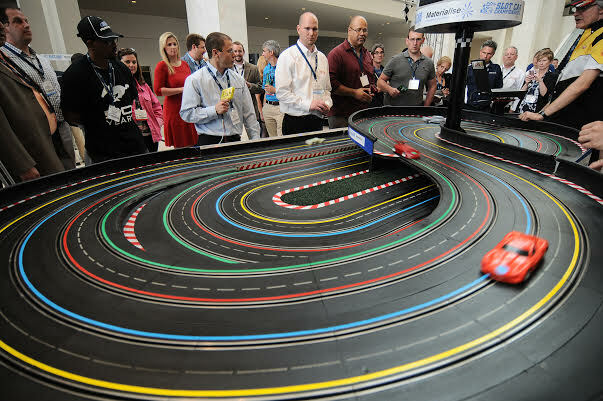 Even if you were not able to submit a car of your own, all attendees were able to try racing a slot car on the exhibition floor. During last year’s RAPID show, Materialise launched a slot car challenge giving participants an entire year to design and 3D print a slot car. The results were impressive and included iconic designs like the 1955 Ford pickup truck, hot rods, a row boat and even an ice cream truck that played music! Many of the contestants used Materialise’s 3-matic software to design their car or enhance its look by applying textures, labels and logos. Each design was then optimized and prepared for 3D printing with the robust tools in the Magics software. “Our goal of the slot car championship was to showcase how 3D printing can improve design and performance while resulting in a one-of-a-kind car that’s aesthetically pleasing. It was fun to see how creative the submissions were and even more exciting when you consider how these same individuals are using their creativity and 3D printing to solve so many problems in the real world,” commented Wilfried Vancraen, Founder and CEO of Materialise. Materialise also teamed up with two local Detroit organizations to help them design and 3D print a slot car. A student from Detroit Institute of Technology College Prep High School at Cody, who finished second, and also a student from Focus Hope worked with the Materialise engineers and learned how to design for 3D printing and also how to optimize the STL file for build. One of the racers in the contest was from Proto Labs. 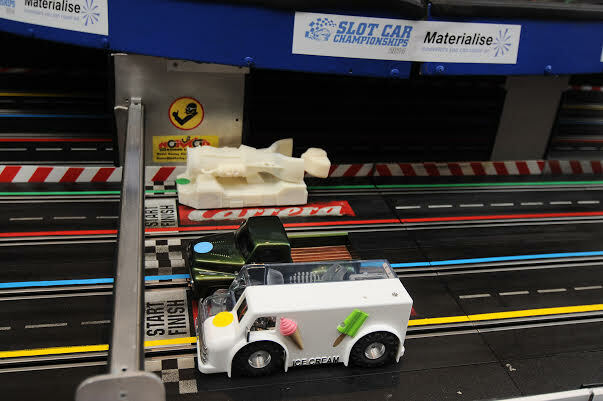 "Making the body for the slot car competition was a great, collaborative project for us at Proto Labs. We got to make a unique design with our 1955 Ford F100 using our skills and abilities with additive manufacturing technologies and using Materialise’s Magics RP software to perform all of our design modifications,” commented Andrew Rogers of Proto Labs. STL files and generate quotes. From design through production and machine control, Materialise seems to have a solution for everything you need to be successful in the world of 3D Printing.